Despite the fact that members of the Kirov regional Legislative Assembly have dropped the idea of holding a vote of no confidence in Governor Nikita Belykh, his possible dismissal is still under consideration, Vedomosti reported on Thursday. “The issue of Belykh’s dismissal has not been removed from the agenda, and it is still quite likely,” a source close to the presidential secretariat told Vedomosti, and another Kremlin official confirmed this. Vedomosti points out that the main reason for Belykh’s possible dismissal is growing tension between him and local elites, primarily the team of former Governor Nikolai Shaklein. The Kremlin was also unhappy to hear Belykh say that he could run in early gubernatorial elections in 2013 and decided not to wait until 2014, when his term in office should normally expire. The Kremlin is already considering possible candidates for Kirov governor, among them State Duma deputies representing the Kirov region Vyacheslav Timchenko, the leader of United Russia’s local branch, and Oleg Valenchuk of United Russia, it said. 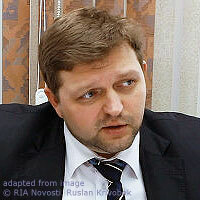 Presidential press secretary Dmitry Peskov told journalists earlier that Belykh’s early dismissal was not on the table.